Last Sunday, Paul promised me that we will be having a food trip. This got me really excited yet I was simply expecting that he'd only be game to go somewhere new for lunch and that would qualify as a "food trip." Well, guess I was surprised when he was in fact game to go food tripping the entire afternoon which made me very very very happy. Ladies, this is one perfect example of why we shouldn't over-expect and just let our man surprise us trust me, it will be ten times better. Hahaha! So, he knows that I keep a list of places that I want to try here in Singapore and told me to choose where to have lunch. My choice was at Bukit Merah which is just a quick 3 minute ride from home. I've been hearing about Two Wings from fellow food bloggers and how their fried chicken wings are simply divine. After seeing countless Instagram posts too, I knew this is the place to go. Spotting Two Wings wasn't difficult as we have been frequenting the Alexandra Food Village quite often. It's located a block behind it and what I wasn't expecting was to see not one, not two but 6 other interesting looking food stalls housed in the same food centre as Two Wings! This is your modern day hawker centre where each stall offers a more upscale cuisine such as one that serves French food, another offering a variety of seafood dishes and a dessert stall too. However, I was there to eat some chicken wings so I guess I'll be going back more often now to try the others. This is definitely my type of hawker centre! The menu of Two Wings is pretty straightforward. It's all about chicken, chicken and more chicken! The best-sellers are definitely the Chicken Wings (S$8.50/4 pcs, S$12.50/6 pcs, S$24/12 pcs) which fellow food bloggers have been raving about! They also have Spring Chicken, Chicken Cutlet, Chicken Salad for the health-conscious, Chicken Wrap and Sandwich and more. We got the 4 pieces Chicken Wings which we feel is just right for the two of us to share. Actually, it was a bit too much as the wings are HUGE! I was already full after finishing one piece but it was so delicious to see the other piece go to waste. The breading had a yummy, umami flavor that I hardly found the need to use the chili and tomato dip that we got. Okay, here's the real test. Since I'm not a fan of chicken skin, I wanted to see if the chicken remains tasty minus the skin -- well it does! I was so happy. I "skinned" my 2nd chicken wing and enjoyed the tender meat inside. 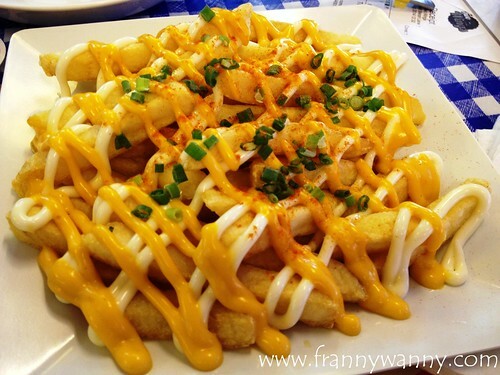 To go with our chicken wings, we had a plate of Cheese Fries (S$4.50) which was a generous serving of shoestring fries drizzled with cheese and garlic mayonnaise. Yum! Beside Two Wings is Brown Sugar, a drink stall selling an assortment of tea drinks. 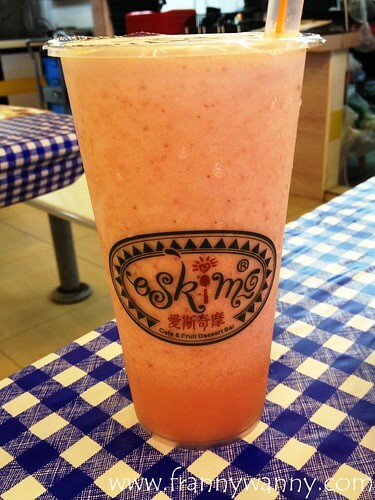 We tried the Strawberry Yakult (S$4.90 / S$6.40) which was surprisingly good! It was indeed a good treat to enjoy given that it was quite warm during lunch hour that day. They also have sparkling fruit tea which sounded so refreshing. I should give that a try next time. This is just the first part of our Sunday Food Trip. I shall tell you more about the second leg in my future posts. 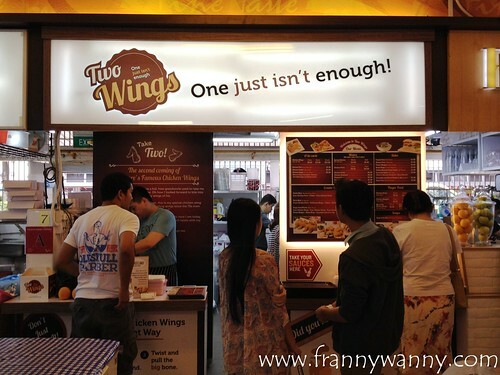 I can't wait to go back to Two Wings and to try the other stalls surrounding it too. To borrow the words of a famous man in history... "I shall return." 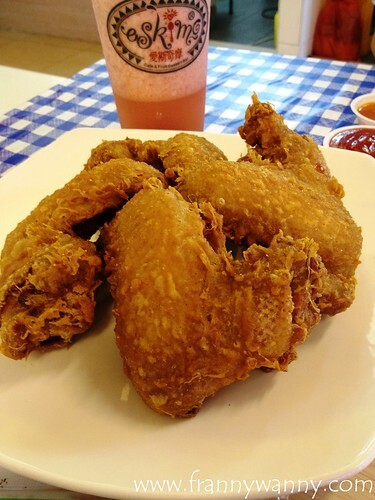 Two Wings and Brown Sugar are located at 119 Bukit Merah Lane 1, Singapore. Two Wings is open from Tuesday - Sunday, 12nn - 3pm / 6pm - 10pm. That "Stew Kuche" place looks interesting - a Singaporean twist on German food?